In a decision delivered in Ku ching High Court this afternoon, Justice Datuk Linton Albert granted leave for Sivarasa A/L K. Rasiah, to commence judicial review proceedings pursuant to his Application made in March 2009. In his Application, the Parti Keadilan Rakyat Vice President and Subang MP Sivarasa Rasiah applied to the High Court for an Order of Certiorari to quash the decision of the First Respondent refusing the his entry into Sarawak by the issuance of the Notice of Refusal of Entry dated 14th February 2009 against the Director of Immigration Sarawak. 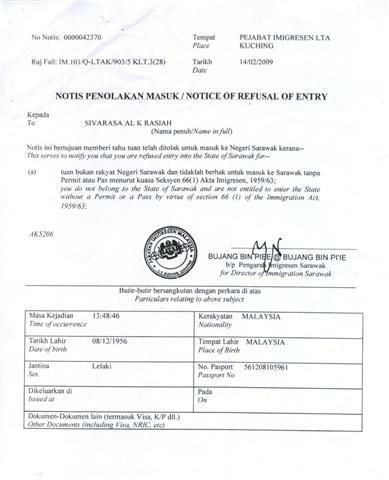 The Keadilan activist lawyer also asked for a declaration that the decision of the Director of Immigration to refuse his entry into Sarawak by was mala fide unlawful unreasonable and or irrational and or ultra vires the Immigration Act and Immigration Regulations, is in excess of his jurisdiction and in breach of the Applicant’s legitimate expectation to enter the State of Sarawak. Granting leave for the Application, the High Court Judge ruled that the application is by no means frivolous and that there is clearly an arguable case which ought to be heard on a full inter parte hearing.